When we embarked upon our MapCarte series last year we wanted to inspire people with examples of beautiful, creative and well designed cartography. Showing people examples of quality was an attempt to counter the tsunami of poor mapping that passes across our digital devices daily. There’s no reason that a general public fascinated with maps can be expected to sift the quality from the quantity. MapCarte was our way of curating a set of maps of all genres that demonstrate the very best in map design. Curated by cartographers for everyone. While we cannot claim credit for a swing in the public desire for better mapping we’d like to think we’ve played a small part and some of the previous offenders are buying into the shift (e.g. here, here, and here for example). It’s what the Commission is designed to do…to promote quality in cartography and be an evangelist for work that showcases the very best in the art and science of map design. The last year or so have seen the publication of a number of excellent books that perform a similar task. These include Jerry Brotton’s ‘Great Maps‘, Daniel Huffman and Sam Mathews’ ‘Atlas of Design Vol 2‘, Rose Mitchell and Andrew Janes’ ‘Maps: Their untold stories‘ and The Times History of the World in Maps. These all contribute to the canon of work that showcases, describes and promotes cartographic design. Commission Chair Kenneth Field contributed to the Atlas of Design with an introductory essay and to The Times’ publication with a discussion of Google Maps. Ken is also involved in his day job at Esri helping a wider team to curate an online gallery of maps that demonstrate the cartographic potential for people using Esri’s ArcGIS platform. The site’s called Maps We Love and while you may not love them all, it performs a parallel purpose to MapCarte. Indeed, the idea of Maps We Love was inspired by what we did with MapCarte more generally. The trend of publishing collections or compilations of examples of good quality map design has also been implemented by many other mapping organisations and publishers continue their fascination with great cartography. 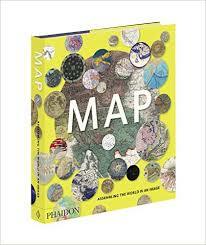 There’s a new book on the market that continues this trend…’MAP‘ by Phaidon Press (published 28th September). Ken was asked to contribute to this edited collection of 300 maps and this became a great opportunity to use the words we penned for MapCarte in a different way. Ken wrote descriptions for 23 of the maps alongside a huge team of contributors. Edited by John Hessler from the Map Division, U.S. Library of Congress, the maps are given space to shine in the 12″ by 10″ hardback book. Heavy duty paper literally adds weight to the tome and the text is kept to a minimum by simply identifying key characteristics or aspects of importance. Curated content is the key to this and other publications alike. It’s authoritative and provides a terrific window onto cartography and maps more generally. It also includes a timeline of the history of cartography, a glossary of useful cartographic terms and links to further reading. Much like MapCarte the collection is eclectic and it’s fascinating to see there’s probably only an overlap of 100 or so maps between our own collection and the maps featured in MAP. This is to be expected…any collection of maps chosen by one group of people will include examples not selected by others. That’s part of the beauty and breadth of cartography. On reflection, yes, there’s probably some from MAP that we might have put in MapCarte but if you join the dots in all of the above collections there’s commonality as well as divergence. The simple fact is as a group of academics, practitioners and map experts we’re finally taking what we know to the general public. Taking responsibility to share some of what we know as cartographic experts is vital to informing people about map design. It’s also important that this drives their yearning to become smarter map-makers. Knowing a little of the cartographic design process allows people to better understand what they require for their own work, and how to discern quality from the plethora of rather uninspiring (or plain wrong) work out in our world. It’s been tremendous to see how MapCarte has both inspired and sat alongside other similar projects. This can only support the dissemination of better mapping and help people to demand more of their maps. We’ll continue to publish infrequent MapCarte entries as and when the whim takes us…and as we look toward the culmination of our first 4 years as an ICA Commission we look forward to our second term.